To Big Horn Airways Inc., Sheridan, WY 18-Sep-2018. This aircraft has been parked at Great Falls, MT since 02-Feb-2017, when it arrived from Malta. Flew Calgary-Int'l, AB - Vancouver-Int'l, BC 11-Aug-2018 on lease to Central Mountain Air. Registration cancelled 24-Aug-2018 to Guernsey. Flew Kagoshima - Sapporo - Petropavlovsk - Nome, AK - Anchorage, AK - Everett, WA - San Bernardino, CA 21/25-Aug-2018. Flight planned for Toronto-Pearson, ON - St. John's, NL - Santa Maria 31-Aug-2018. It is en route to Johannesburg on delivery to CemAir. Flew Muskoka, ON - Collingwood, ON - Toronto-Pearson, ON 30-Aug-2018. 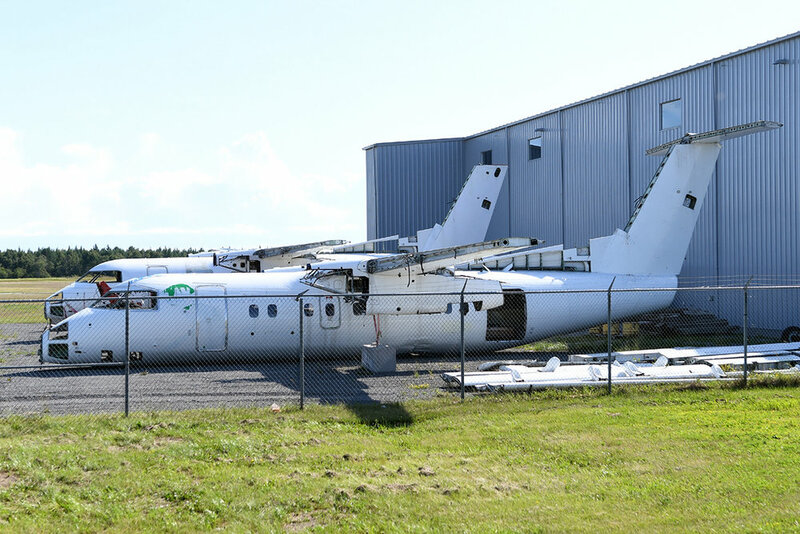 The aircraft had been in Muskoka since the 16-Aug-2018. Test flown from Toronto-Downsview, ON 30-Aug-2018 as BBA20. Flew North Bay, ON - Toronto-Downsview, ON 27-Aug-2018; the aircraft had been in North Bay since 03-Aug-2018. Damaged at Lima 19-Aug-2018 during landing with nose gear retracted. The aircraft had earlier departed Lima for Ayacucho. Following painting, the aircraft flew Malta - Tamanrasset - Accra 19-Aug-2018 on delivery. Registered to Westjet Encore Ltd., Calgary, AB 20-Aug-2018; this aircraft has remained registered to Bombardier until now. To Dynamic Aviation Group Inc., Bridgewater, VA 16-Aug-2018 and registered same day as N590K. The aircraft is seen below while still with Travira Air. Flew Toronto-Pearson, ON - Muskoka, ON 16-Aug-2018. N208WQ has been present in Toronto since 22-Jun-2017 when it arrived from Coeur d'Alene, ID. Test flown from Toronto-Downsview, ON 15-Aug-2018 as BBA14 - Spicejet c/s. Flew Winnipeg, MB - Ottawa, ON - St. John's, NL 01-Jul-2018 returning to PAL. Registered to PAL Airlines, St. John's, NL 15-Aug-2018. Updating entry fro 03-Aug-2018; registered to Sierra Nevada Corp., Sparks, NV 14-Aug-2018 as N489SN. Entered service 01-Aug-2018 Calgary-Int'l, AB - Edmonton-Capital, AB - Primrose, AB. Primrose is the Canadian Natural Resources airfield serving their oil sands projects. 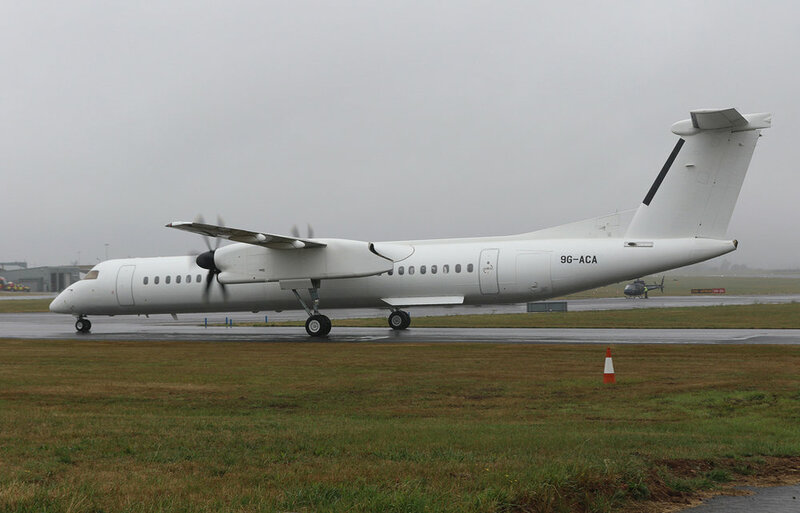 Bombardier Commercial Aircraft announced today that the company successfully placed three pre-owned Q400 turboprops with PassionAir from the Republic of Ghana. The airline acquired the aircraft through a dry-lease with a third party. Kathmandu-based Shree Airlines has received Civil Aviation Ministry, and Civil Aviation Authority of Nepal approval to proceed with the acquisition of three Q400 aircraft. The company currently operates two CRJ-200's and two CRJ-700's. The approval stipulates the Q400's must be based outside of Kathmandu, and Shree has indicated they have selected Pokhara as the base. I believe the aircraft below is MSN 366, the former C-GFKE which went to 748 Air Services in Jul-2017. The Air Niugini DHC-8 which was burnt out during civil unrest at Mendi 14-Jun-2018 has now been scraped up and removed from the ramp, as can be seen below. Noted outside at Maastricht 10-Aug-2018, has been present since 07-Jul-2018. Arrived Maastricht 02-Aug-2018 for attention by SAMCO. Updating entry for 07-Aug-2018; as I suggested then, it did in fact continue on to Muskoka later the same day. Registration cancelled 30-Jul-2018 to U.S.A. as N690UA. Flew Toronto-Pearson, ON - Goose Bay, NL - Keflavík - Exeter - Malta 10/11-Aug-2018 on delivery to Passion Air of Ghana. It is seen below at Exeter, and is expected to be painted in Malta. As covered extensively in the media over the past 24 hours, in a bizarre incident last evening the aircraft was stolen while on the ground at Seattle/Tacoma by a company employee, and subsequently crashed in a forested area on Ketron Island, WA. Flew Salisbury, MD - Lake Simcoe, ON 07-Aug-2018; it had previously been parked at Salisbury since 29-May-2018. I'd guess the aircraft is ultimately destined for Muskoka. Updating yesterday's report; aircraft has become 9G-ACA, and noted as such at Toronto-Pearson 03-Aug-2018. Flew El Aaiún - Tangier - Pau - Birmingham - Stornoway - Keflavík - Iqaluit, NU - La Grand Riviere, QC - North Bay, ON 21/24-Jul-2018 returning from United Nations duties. Registered 30-Jul-2018, ex N804EX; aircraft had previsouly flown Great Falls, MT - Calgary-Int'l, AB 20-Jul-2018. Flew Bridgewater, VA - Hamilton, ON - North Bay, ON 17-Jul-2018 for attention by Voyageur. Flew Calgary-Int'l, AB - Great Falls, MT 20-Jul-2018. Flew Muskoka, ON - Erie, PA - Shenandoah, PA 26-Jul-2018; the aircraft had been at Muskoka since 02-Jul-2018. Registered to Canadian North Inc., Calgary, AB 10-Jul-2018 as C-GJCN. Flew Nairobi-Wilson - Alexandria - Malta 18-Jul-2018 on return to AMRA/MDT. Registration cancelled 30-Jul-2018 to U.S.A. for Sierra Nevada Corp. Registered to Unical Aviation Inc., City of Industry, CA 31-Jul-2018 as N690UA; it had earlier been registered on 09-May-2018. Registration cancelled 02-Aug-2018 on export to Ghana for upstart PassionAir. The new carrier is expected to begin flying mid-month with services from Accra to Kumasi. C-FXIC has been in Toronto since Oct-2017, and is the former G-JECE. Registered to Unical Aviation Inc., City of Industry, CA 27-Jul-2018 as N691UA. Repairs completed, and flew Amsterdam - Malta 28-Jul-2018 for painting. The aircraft had been under repair at Amsterdam since a gear collapse on landing 23-Feb-2017. Test flown from Toronto-Downsview, ON 12-Jul-2018 as BBA3, in Spicejet c/s. Noted at Toronto-Downsview, ON 18-Jul-2018 in primer. Registered to K. Dawson and Associates Inc., Sidney, BC 28-Jun-2018 as C-FKVN. Registration cancelled 29-Jun-2018 and officially imported to Canada the same day. Flew Bridgewater, VA - Erie, PA - Muskoka, ON 02-Jul-2018 for painting by Muskoka Aircraft. Flew Montréal-Trudeau, QC - St. John's, NL - Ponta Delgada - Nouakchott 21/22-Jun-2018, and Canadian registration cancelled 29-Jun-2018 to South Africa. 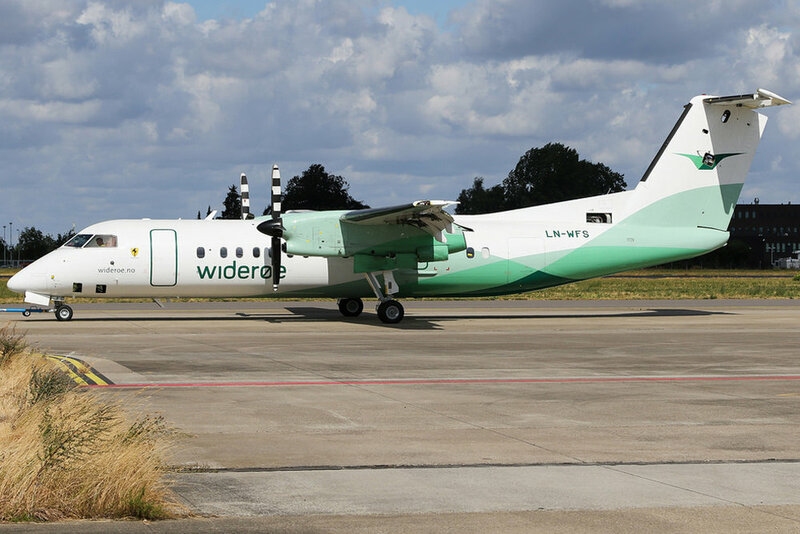 Updating entry for 19-Jun-2018; to Nordic Aviation Capital, Billund [NAC Aviation 24 Ltd.] 27-Jun-2018 and has been leased to 748 Air Services Ltd., Nairobi-Wilson. Flew Toronto-Downsview, ON - Goose Bay, NL - Keflavík - Paris-Le Bourget - Malta - Luxor - Sharjah - Ahmedabad - Dhaka - U-Tapao - Manila 22/27-Jun-2018 on delivery. Registration cancelled 19-Jun-2018 to Canada. The aircraft has been parked at Great Falls, MT since 22-Feb-2018. Updating entry for 19-Jun-2018; continued Toluca - Liberia - Guayaquil - Lima 19/20-Jun-2018 on delivery to LC Perú. Registration cancelled 19-Jun-2018 to the Philippines; noted at Downsview same day with fleet number 5909.